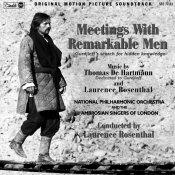 Music for the Film "Meetings with Remarkable Men"
Very often people come away from a film totally unaware theyve heard any music. Oh! Was there music in that film? I never noticed it, I was so engrossed. And yet all through the film the music was working on them. Music seems to come in through the pores. It enters our unawareness directly. Every film has its own way of accepting music. Some accept more, others less. Peter Brooks original musical concept for Meetings with Remarkable Men was surprising to me. The fashionable approach in current filmsespecially avant-garde filmsis toward a sparing use of music, lots of powerful silence. But Peter envisioned the opposite: music pervading the film, music of all kinds and colors, a rich atmosphere of sound to be breathed in and constantly inform the films changing images. The score that eventually took shape was much nearer to this than to the sparse approach, although of course the crucial dialogue scenes containing essential ideas were all framed in silence. Photos © 1978 REMAR, Inc.